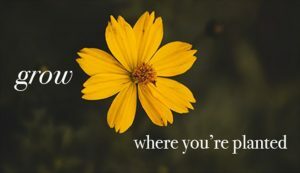 Do you ever feel that you're not where you're supposed to be? Or that the "grass is greener" elsewhere? That (despite working diligently to do what is right) you don't earn the promotion, opportunity or support that you seem to need? You're not alone. 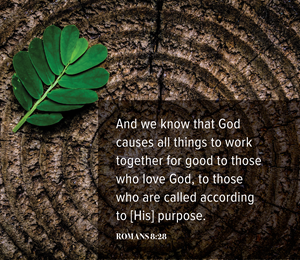 But knowing and remembering that God causes all things to work together for good are not the same. It is important for us to remember this, especially during trying times. We're going to look at some Biblical examples of people who had to "grow where they were planted." Have you ever considered what it must have been like for Ruth (a Gentile) to marry into a Jewish family? Ruth was newly widowed. She had married into a foreign family and her mother-in-law, Naomi, decided to return to her own people. Ruth was faced with a choice. On the one hand, Naomi was now family. On the other hand, she was about to move back to Israel— a place with strange customs, a different god, and no other relatives to feel at home with. Ruth was likely still a young woman. She had been married for only ten years and at this point had no children. Moving to Israel was a life-altering decision. She could have no expectation of another husband or of anything familiar to her, except one—her mother-in-law, Naomi. And so, Orpah did go back to her people and her gods. But Ruth made a different choice. Ruth was committed to her course! We are not told of any grumbling, misery or dejection on her part. Rather, she devoted herself to caring for her mother-in-law. After returning to Judah, Ruth went into the fields to glean from the remnants left by the harvesters. This was a lowly task, indicating poverty. But she did what was needed to take care of Naomi and herself. In what ways can we be more like Ruth? Do we ever find ourselves faced with a choice to "do the right thing" even though it may be personally challenging? Ruth left an example of strength and did what was necessary despite the difficulties involved. In the end, she was greatly blessed for doing the right thing. Esther was another example of a strong character. Orphaned at a young age and then, as a teenager given to a heathen the king as a potential bride, she used these seeming disadvantages to save her people. King Ahasuerus was a violent man and could react with impunity. Esther's life did not become easier when she became queen. But she used it to play a key role in stopping Haman's evil plot to kill all the Jews in the land. She was to outmaneuver Haman, the king's most trusted advisor. Now around the age of 20, she must play it just right. Any misstep could be fatal. Faced with all these challenges, she, at first hesitated, but then acts with the encouragement of her uncle Mordecai. Rather than enjoying a royal life of luxury she recognized God's leading. It was made clear to her through the words of Mordecai that she was there for a purpose. Esther realized that her circumstances were not a coincidence. If ever there was leading of the Lord, this was it. She gave meaningful instructions to her people. Once again, we have a lesson of doing right even in troubling circumstances. Jesus said, "Take no thought for tomorrow, for tomorrow shall take care of itself" (Matthew 6:34). Each day has enough trouble of its own. So, do what is right today. Sometimes we struggle to recognize what the Lord's will is for us. We attempt to open the doors before us and sometimes they open, sometimes they do not. However, when we feel directed by circumstances outside our control it does us no good to complain or fight against them. Before Esther acted, she prayed. This is an important thing whenever we are looking for direction, especially when confronted with challenging experiences. 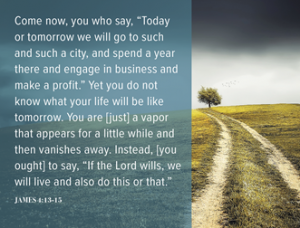 When the Lord's will becomes clearer we should move forward, without grumbling or second-guessing, trusting that He will overrule and care for us. Jonah is an example the Bible gives us for fighting against God's will. God was in the process of planting Jonah in Nineveh but Jonah did not want to be planted there! The results brought only trouble and distress to Jonah. Do we ever fight against God's direction? 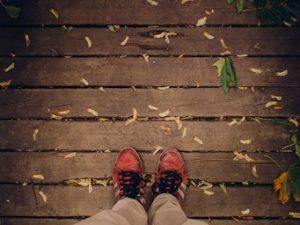 Do we ever get the impression that God wants us to go in one direction, but we would rather go the other way? Jonah was directed by God to preach to the people of Ninevah. But Jonah felt they did not deserve to hear the word of the Lord and should rather be destroyed. with this attitude he made himself their judge. Jonah was displaying a common aspect of human nature that makes assumptions about the character and motivation of others. It is easy to be convinced that we know the heart attitude of another. The lesson from Jonah is to not give in to this temptation of judging others and to not fight the direction in which God leads us. We are handed tools, talents and opportunities. Our job is to use them and do the best we can. God will handle His part without needing intervention from us. Next, we turn to Joseph. He is decidedly different than his brothers. He dreams, and when he shares his dreams he is ridiculed and persecuted by them. He is even rebuffed by his father! Their hatred drove his brothers to sell Joseph into slavery and his life quickly changed from being a favored child to a life of slavery. From his behavior we must surmise that Joseph took each day as it came, doing the best he could with his current situation, even excelling at the tasks before him. Certainly, there was providence involved; but wherever he went Joseph was recognized as being special, except by his own brothers. 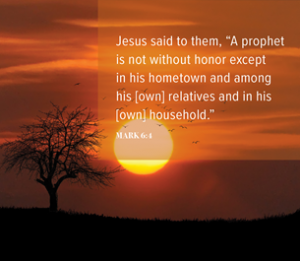 Joseph was such a faithful servant that he rose to a privileged position in the household of Potipher. Then, accused by his master's wife he was demoted once again and off to prison. But even there he maintained his faith and positive outlook. His integrity was once again noticed, for he found favor in the jailer's sight and put in charge of all the prisoners. This led to his interaction with the Pharaoh's imprisoned cup-bearer and baker. After correctly interpreting their dreams he was eventually led to the service of Pharaoh himself. By interpreting Pharaoh's dream indicating a coming famine, Joseph was charged with managing much of Egypt's economy. As the famine spread to the land of Canaan his family came to buy food. When he saw them he displayed no anger or desire for revenge. In every step of his life he behaved with grace and dignity. He never wept or allowed his circumstances to control him. His elevation did not happen because of self-pity or second-guessing his decisions. Do we sometimes fall into the trap of thinking "woe is me," or "why is God allowing this to happen to me?" Joseph provides a great example for us. Sometimes, we simply need to stop over-analyzing our situation and get to work (whatever the job may be). 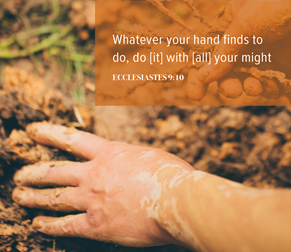 If we are fully committed to doing God's will we cannot fail because He will always do His part in bringing an eventual blessing to us. Our spiritual success is far more important to God than our earthly success. I God is involved in directly our lives a greater and wiser success will be achieved. Now, let us turn to the Apostle Paul. He persecuted Christianity with a vengeance, only to find out he was wrong. Imagine the shame and guilt that might follow such a realization. How does one get over that? But after correcting Paul the Lord directed him to go among the very people he persecuted (in spite of many who mistrusted him) and spend his life caring for them. Paul also had to endure persecution from those that felt threatened by Christianity (from the Roman government to the Jews). However, he never stopped preaching the Gospel and it eventually cost him his life. But his eternal life was secure in God, who rewards faithful service and values such conviction. Paul wrote, "We are troubled on every side, yet not distressed; we are perplexed, but not in despair (1 Corinthians 4:8. Paul was faced with many roadblocks that may have stopped a weaker man. So, when faced with roadblocks, we must not give up. It is important to determine if a roadblock is from the Lord or from worldly interference. We should pray about the situation and confer with our brethren in the hopes of gaining improved perspective and guidance from the holy Spirit. We must simply do the best with what we have. We can trust the guidance of an educated conscience and move forward! But we should be open to the possibility that our opinions may be flawed and actively seek to improve our judgment and understanding. Paul had very strong opinions (albeit misguided); but, once he was told of his errors he changed course and devoted himself to his new-and-improved understanding. How we react, adapt, and grow from our mistakes is more important to our development than the fact that we make mistakes. 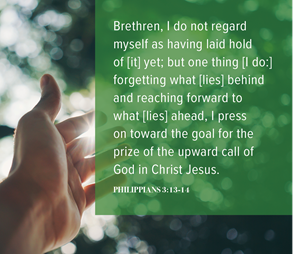 We must press on toward the goal of always doing God's will. Our last example is Joshua. Around 35 years old, Joshua and several others were sent to spy out the land of Canaan. But of the twelve spies only Joshua and Caleb believed they could take the land, understanding the Lord would help them. Because of the fear created by the ten spies who said the inhabitants of the land were giants, and they were like grasshoppers by comparison, the people were unwilling to enter the land. As punishment, the entire nation was relegated to wandering in the wilderness of Sinai for 40 long years. What a reversal of experience for the people. They had just made a long arduous journey to the Promised Land! Through the eyes of the spies they saw the riches of the land and the prospect of a permanent home. But because of fear, they were not allowed to go in! Instead, they roamed the wilderness, living off a daily provision of manna and quail. Joshua's reaction, as usual, was exemplary. He and Caleb understood that the Lord's hand would have deliver them. But they too must spend much of their lives in the wilderness. Having to go back into the wilderness Joshua must have possessed great patience. He made no complaints. He accepted the will of God without questioning. Like the other individuals we have examined, Joshua provides an example of patience endurance. Sometimes we are overanxious for something to happen. But part of faith is to wait for the Lord's timing and not demand instant results. There is often great wisdom in waiting, trying to have a cheerful heart in spite of delay. Committing ourselves to God's timetable is a great blessing. We must grow where we are planted and not demand that God move us to a more pleasing spot. The reaction we have to an experience is really a choice we make. When an experience is unpleasant we may, by default, choose to be irritated and annoyed. Or we can choose to take the experience as an opportunity to express our trust and confidence in God. It is plain which is the wiser course. Sometimes it is just a matter of setting one foot in front of the other and moving on in life. God does not promise that life will be carefree and painless. 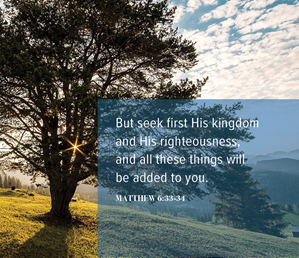 In fact, a faithful follower of Christ is asked to give his life as a "living sacrifice." (Romans 12:1) This requires patience, commitment and a focus on doing God's will. 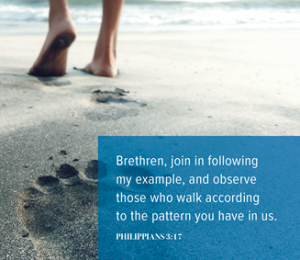 Enduring hardship with grace and dignity will show others that we are different and focused on serving God. We must not grumble or complain about God's providence. Make the best decisions you can, rely on the Lord and prayerfully consider your experiences. Resolve to be aware of your mistakes, learn from them, and continue to push forward knowing that God will bless your sincere efforts. Above all, trust in the Lord. He does not ask for more than our best efforts.